This is an unusual 1976 map of Beijing or Peking, China. This map was published in the final year of the Cultural Revolution and just a few months before Mao's death. 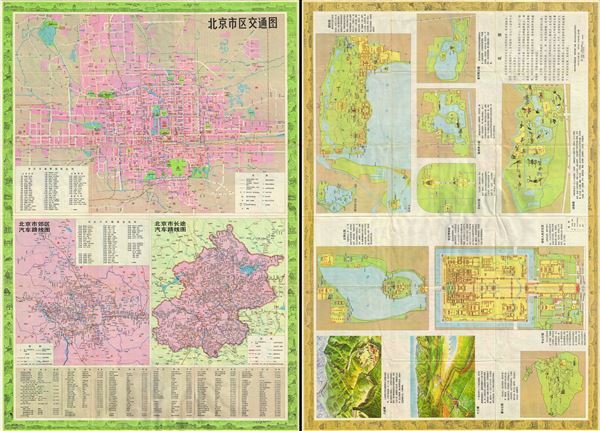 Printed on both sides, recto contains three incredibly detailed maps, depicting the entire city of Beijing and the region showing streets, parks, railroads, Beijing metro etc. Verso contains several inset maps and views featuring the Forbidden City, the Summer Palace, the Great Wall, Bei Jai Park, the Beijing zoo, etc. Other important tourist information is also included on both sides of the map. This map was published in China in 1976. The image above represents both recto and verso of the same map. Very good. Minor wear along original fold lines. Printed on both sides. Image above represents two sides of the same map. Comes with original cover.